Below is the record of the EIR certification process. On February 28th, 2017, the Harbor District Commission approved Resolution 2017-02, adopting CEQA Findings of Fact; adopting a MMRP; and certifying the Final EIR (FEIR) for the Coast Seafoods Company Humboldt Bay Shellfish Aquaculture Permit Renewal and Expansion Project. They also approved Humboldt Bay Harbor, Recreation, and Conservation District Permit 14-03 which specifies the Environmentally Superior Alternative. Tuesday, February 28, 2017 from 6:00 – 8:00PM at the Wharfinger Building, 1 Marina Way Eureka, CA. The Commission will also consider approval of the project’s associated Harbor District permit and a Revised Mitigation Monitoring and Reporting Program. All interested persons are invited to be present and be heard. Written communications may be directed to: Jack Crider, Executive Director, 601 Startare Drive, Eureka, CA 95501, or by email to jcrider@humboldtbay.org. 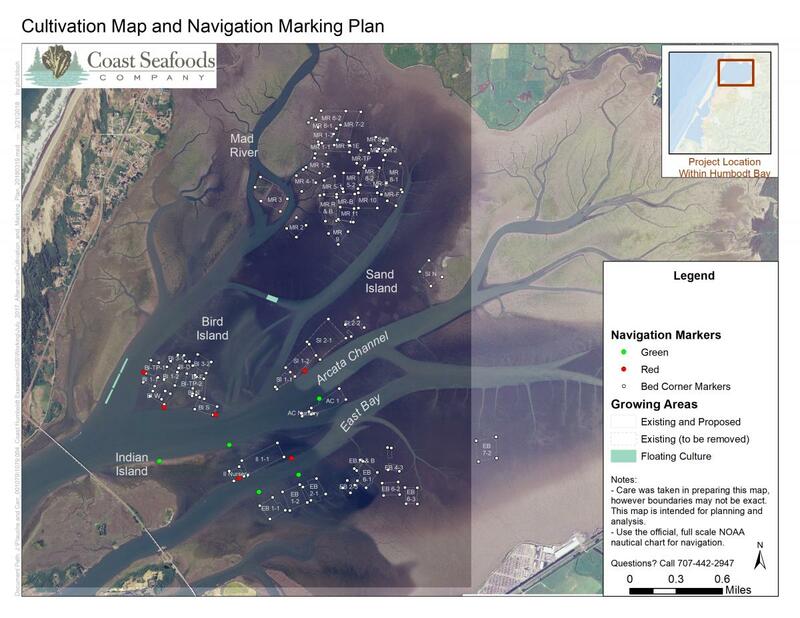 The Humboldt Bay Harbor, Recreation and Conservation District, as lead agency, has prepared the Final Environmental Impact Report (FEIR) for the Coast Seafoods Company Humboldt Bay Shellfish Aquaculture Permit Renewal and Expansion Project. DOCUMENT AVAILABILITY: Copies of the FEIR are available for review at the links below, Harbor District Offices, 601 Startare Drive, Eureka, CA 95501, and at the Humboldt County Library – Main Branch, 1313 3rd Street, Eureka, CA 95501.